Baroque Guitar Interpretation Of Jean Voboam 1687 - urs-langenbachers Webseite! For this project I have shortened the string length to 66cm. Consequently it requires a thicker string diameter. This feature in combination with a solid top that is not too thin ensures that the percussive characteristics do not become too dominant. 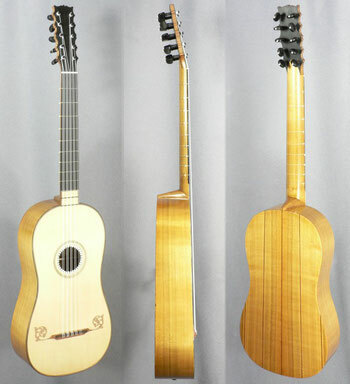 This modell is wearing a plain paper decoration around the soundhole but can also be built with complete multi-layer rosette.